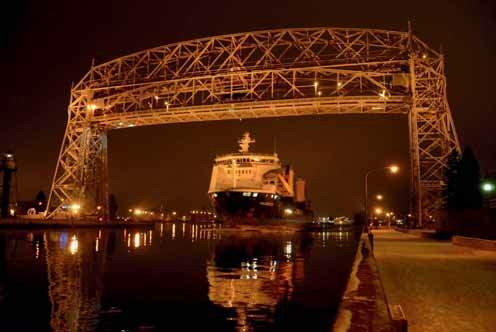 On Friday 19 December last year, the last oceangoing vessel (‘saltie’) to have called on the Port of Duluth-Superior in 2014 departed just after midnight – passing beneath the Aerial Lift Bridge at 12:26 a.m. Saturday morning, to be exact. The Palmerton had arrived earlier in the week to discharge project cargo at the Clure Public Marine Terminal in Duluth. The 436ft,Antigua-flag Palmerton was the last saltie of 2014 to make the full 2,342-mile transit of the Great Lakes St. Lawrence Seaway system from the Head of the Lakes to the Atlantic Ocean. Both the Welland Canal, which connects Lakes Erie and Ontario, and locks on the Montreal-Lake Ontario section of the Seaway closed on 31 December. Laker traffic, however, continued on the Great Lakes for a further four more weeks as the ‘Soo Locks’ (i.e. locks at Sault Ste. Marie, Mich.), did not officially close to vessel traffic until midnight on 15 January. Those locks are scheduled to reopen for the 2015 commercial navigation season on 25 March. Despite coming off the most brutal winter in decades to start the 2014 season and dealing with rail capacity issues, Great Lakes freighters have worked hard to make up for tonnage and transits lost in the ice-choked months of March and April. In fact, on many fronts, year-to-date shipments through the Port of Duluth-Superior have nearly caught up to where they were at the same time the previous year — sitting at 32.4 million short tons through November. Shipments of iron ore (to domestic and Canadian steel mills) are up nearly 6% to 15.3 million short tons; and increases in commodities like limestone and salt plus general cargo shipments helped offset declines in coal and grain this season. Although ice has already formed on Lake Superior and elsewhere in the system, shipping has not been significantly impacted so far this winter. Freighters continue their end-of- season push to deliver iron ore to mills on the Lower Lakes to ensure sufficient inventories for steelmaking while locks are closed ... to build up stockpiles of coal at utility companies and other customers in that same region ... and, on the inbound side, to ensure there are sufficient supplies of limestone, salt and other bulk commodities on the ground here in the Twin Ports to last until the locks reopen in March.